Paul Molnar’s work on Divine Freedom and the Doctrine of the Immanent Trinity (T&T Clark, 2002) is well known in Barthian circles. 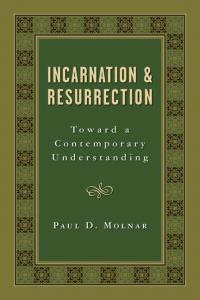 And in this new sequel, Molnar extends his earlier argument: where Divine Freedom argued that God’s action in the world must always be set against the backdrop of an independently-existing immanent Trinity, the present work argues that the resurrection of Jesus must always be interpreted against the backdrop of the incarnation of an eternal Son. Simply put: we must think first of incarnation and only then of resurrection. Molnar’s argument here is driven by the same fundamental categories which shaped his earlier book on the immanent Trinity. Although these categories are rarely analysed explicitly, everything depends on a sequence of paired opposites: the priority of eternity over history, of the objective over the subjective, of reality over experience, of God-in-himself over God-for-us. These categories are adopted from the work of T. F. Torrance, and they subsequently structure both Molnar’s reading of Barth and his critique of various contemporary thinkers. The book’s central thesis is neatly encapsulated in the title: “incarnation and resurrection” – in that order! In Molnar’s view, the incarnation – and behind that, the pre-incarnate Logos – is the only legitimate starting point for christology. All christology must begin with “the eternal Word who was with God and who was God from all eternity” (p. 265). As in his earlier book, Molnar’s basic conviction here is that events in history can never be constitutive of God’s being; God is always God-without-us before he is God-for-us. Jesus’ resurrection, then, can be understood properly only when we start with the fact that the Son “actually existed prior to his human existence” (p. 298), before taking on a human nature “in the Chalcedonian sense” (p. 310). Only on the basis of this cluster of metaphysical assumptions can we then also begin to think about Jesus’ resurrection. The problem with all this, however, is that it represents a complete reversal of the New Testament witness. The New Testament writers knew nothing of an “independent” doctrine of incarnation. They knew nothing of a thought-pattern which begins with a doctrine of pre-existence before moving to incarnation and then finally to resurrection. On the contrary: the early Christians spoke of incarnation (when they mentioned it at all) only as a theological extrapolation of the cosmic significance of the resurrection. Nor did they interpret the resurrection in light of any prior dogma of Jesus’ divine sonship. On the contrary, they knew that Jesus was the Son of God precisely because God had apocalyptically vindicated him by raising him from the dead. In light of the resurrection, it became clear that God had been at work throughout the entirety of Jesus’ career (i.e. “incarnation”) and that Jesus had come from God from the very beginning (i.e. “pre-existence”). 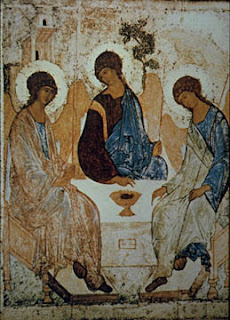 Thus the miraculous birth stories in Matthew and Luke, and the theology of pre-existence in the Fourth Gospel, are strictly indistinguishable from the impact of the resurrection-event – it is this single event which retroactively determines the whole existence of Jesus as the movement of God into our material world. Jesus’ sonship is constituted in the event of resurrection (Acts 13:33; Heb. 1:5; 5:5). The resurrection is “the primal mark of his identity” (J. Louis Martyn); indeed, God’s very deity is not only “disclosed” but also “constituted” in this event (Francis Watson), so that all Christian talk about God must take this event as its fundamental point of departure. To begin christology with any abstract metaphysics of divine being – no matter how “Chalcedonian” that metaphysics might be! – is therefore to fail to allow our talk about God to be guided and structured by the gospel itself. Of course, Molnar is not trying to interpret the New Testament witness directly; his theological sources are Torrance and Barth. But it seems to me that the Barthian tradition today is faced with a fundamental choice here – I’m tempted to say, a choice between Molnar and McCormack! This is a fundamental choice since what’s at stake is not merely the correct interpretation of Barth, but the whole shape and structure of christology and the doctrine of God – in other words, dogmatics itself. I can, of course, speak only for myself here. But I believe the future of theology lies not in any incarnational realism or in a scholastic Chalcedonian objectivism, but rather in a radical and rigorous appropriation of Barth’s christological actualism. And the essential resource for this appropriation is, in my view, the category of resurrection. If we are to pursue theology as a faithful response to the biblical witness, we must seek not merely to defend some particular variety of classical metaphysics, but instead to take our stand on the resurrection itself, and (using whatever conceptual resources we can find) to think the resurrection back into the doctrine of God. This will mean conceptualising the resurrection as absolute divine “advent” (Eberhard Jüngel), sheer “apocalypse” (J. Louis Martyn), pure “event” (Robert Jenson). It will mean thinking an event in which God constitutes his own being (Francis Watson) as a being-for-us in the self-determining movement of Father, Son and Spirit (Bruce McCormack). Here, the category of resurrection functions as metaphysical critique, or rather, as the ground of a properly theological ontology. The resurrection is not (pace Molnar) merely one occurrence alongside others in a linear “history of salvation” (p. 5). It is the event of absolute singularity and therefore absolute universality, the event which tears open (in order to reconstitute) being itself. It is destruction and salvation, the dissolution and re-creation of the kosmos. Far from being the mere disclosure of an already-existing state of affairs, this event is divine apocalypse, trinitarian becoming – no, it is eternity itself. Molnar’s claim, therefore, that a prior metaphysics of divine being should “dictate the meaning of the resurrection” (p. 87) has it precisely the wrong way around: any doctrine of divine being or of incarnation must be “dictated” by the gospel of Jesus Christ, that is, by the proclamation that God has acted once and for all in the resurrection of the Crucified. Likewise, I can only conclude that Molnar’s call for a christology “from above” (i.e., starting with a pre-existent logos asarkos) is a profound mistake. Neither “from below” nor “from above,” but from the event – that, in my view, is the way forward for christology today.